It’s been said that it’s not love that is blind, but jealousy. When left unbridled, jealousy is an incredibly destructive emotion. But if you give jealousy vision, you can use it as an insightful tool to determine the quality of your relationship. Jealousy has several different characterizations, but at its core, there’s usually insecurity. It’s natural to feel a little jealous at the beginning of a significant relationship. You’re vulnerable because you’re not yet assured whether or not she returns your feelings, wants the same things, or deserves your trust. Hence, a little jealousy sparked by past lovers or a stranger flirting with your mate is completely justified. But as the relationship progresses and real trust is earned—and that takes time—the jealousy should be replaced by security. If it isn’t, then jealousy becomes a warning sign. Once you’re in an established, committed relationship, if you’re so jealous that you make sarcastic remarks or start an argument anytime another man or woman is mentioned (even a coworker or family member), or you keep a watchful eye over everything your partner does, you need to do some soul searching. Ask yourself if you’re being realistic. Does your partner give you a reason to suspect him or her of cheating? Has his or her behavior changed? If you can honestly answer yes, or if this jealous behavior is completely out of character for you, then trust your instincts — get out now! Without trust, it isn’t a real partnership anyway. But if you can admit that your jealousy isn’t motivated by your mate’s actions, then you need to do some healing before you ruin the relationship you’re so afraid of losing. Start by trying to pinpoint the source of your insecurity. Perhaps you just don’t feel desirable enough. If you’ve been burned before, you’re most likely gun-shy and reacting to your current partner as you did to your ex. Or maybe you have a tendency to cheat, in which case you’re probably projecting your own behavior on her. Whatever it is, it’s not fair—and it’s destructive. Stay in the moment and only react to what’s in front of you. Stop trying to control anyone else; you can only control yourself. Find other things to focus your attention on, ex: hobbies, charity work, school. Raise your self-esteem with affirmations and a positive internal dialog. If you don’t truly feel lovable, how can you possibly believe or trust anyone who says he or she loves you? You need to love yourself the most. Contact me if you need support to control your jealousy, raise your self-esteem, or save your relationship. 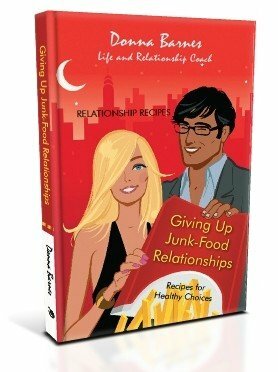 Learn more about how to communicate better in my book: Giving Up Junk-Food Relationships: Recipes for Healthy Choices.